For other uses, see Feldspar (disambiguation). Compositional phase diagram of the different minerals that constitute the feldspar solid solution. A crystal or crystalline solid is a solid material whose constituents are arranged in a highly ordered microscopic structure, forming a crystal lattice that extends in all directions. In addition, macroscopic single crystals are usually identifiable by their geometrical shape, consisting of flat faces with specific, characteristic orientations. The scientific study of crystals and crystal formation is known as crystallography. The process of crystal formation via mechanisms of crystal growth is called crystallization or solidification. The name feldspar derives from the German Feldspat, a compound of the words Feld, "field", and Spat meaning "a rock that does not contain ore". 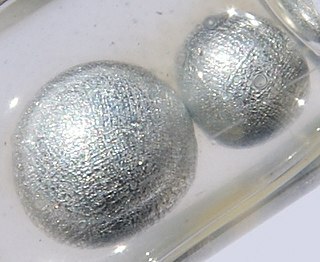 The change from Spat to -spar was influenced by the English word spar,  meaning a non-opaque mineral with good cleavage. Feldspathic refers to materials that contain feldspar. The alternate spelling, felspar, has fallen out of use. Solid solutions between K-feldspar and albite are called "alkali feldspar". 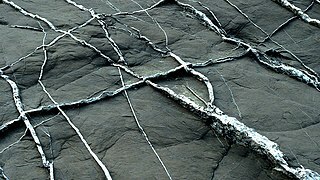 Solid solutions between albite and anorthite are called "plagioclase",  or more properly "plagioclase feldspar". Only limited solid solution occurs between K-feldspar and anorthite, and in the two other solid solutions, immiscibility occurs at temperatures common in the crust of the Earth. Albite is considered both a plagioclase and alkali feldspar. Potassium and sodium feldspars are not perfectly miscible in the melt at low temperatures, therefore intermediate compositions of the alkali feldspars occur only in higher temperature environments. Sanidine is stable at the highest temperatures, and microcline at the lowest. Perthite is a typical texture in alkali feldspar, due to exsolution of contrasting alkali feldspar compositions during cooling of an intermediate composition. The perthitic textures in the alkali feldspars of many granites can be seen with the naked eye. Microperthitic textures in crystals are visible using a light microscope, whereas cryptoperthitic textures can be seen only with an electron microscope. anorthite (90 to 100) CaAl2Si2O8. Intermediate compositions of plagioclase feldspar also may exsolve to two feldspars of contrasting composition during cooling, but diffusion is much slower than in alkali feldspar, and the resulting two-feldspar intergrowths typically are too fine-grained to be visible with optical microscopes. The immiscibility gaps in the plagioclase solid solutions are complex compared to the gap in the alkali feldspars. The play of colours visible in some feldspar of labradorite composition is due to very fine-grained exsolution lamellae. The specific gravity in the plagioclase series increases from albite (2.62 g/cm3) to anorthite (2.72–2.75 g/cm3). Chemical weathering of feldspars results in the formation of clay minerals  such as illite and kaolinite. In earth sciences and archaeology, feldspars are used for K-Ar dating, argon-argon dating, and luminescence dating. Lunar ferrous anorthosite #60025 (plagioclase feldspar). Collected by Apollo 16 from the Lunar Highlands near Descartes Crater. This sample is currently on display at the National Museum of Natural History in Washington, D.C.
Microcline (KAlSi3O8) is an important igneous rock-forming tectosilicate mineral. It is a potassium-rich alkali feldspar. Microcline typically contains minor amounts of sodium. It is common in granite and pegmatites. Microcline forms during slow cooling of orthoclase; it is more stable at lower temperatures than orthoclase. Sanidine is a polymorph of alkali feldspar stable at yet higher temperature. Microcline may be clear, white, pale-yellow, brick-red, or green; it is generally characterized by cross-hatch twinning that forms as a result of the transformation of monoclinic orthoclase into triclinic microcline. The mineral anorthoclase ((Na,K)AlSi3O8) is a crystalline solid solution in the alkali feldspar series, in which the sodium-aluminium silicate member exists in larger proportion. It typically consists of between 10 and 36 percent of KAlSi3O8 and between 64 and 90 percent of NaAlSi3O8. Nepheline syenite is a holocrystalline plutonic rock that consists largely of nepheline and alkali feldspar. The rocks are mostly pale colored, grey or pink, and in general appearance they are not unlike granites, but dark green varieties are also known. Phonolite is the fine-grained extrusive equivalent. Perthite is used to describe an intergrowth of two feldspars: a host grain of potassium-rich alkali feldspar (near K-feldspar, KAlSi3O8, in composition) includes exsolved lamellae or irregular intergrowths of sodic alkali feldspar (near albite, NaAlSi3O8, in composition). Typically the host grain is orthoclase or microcline, and the lamellae are albite. If sodic feldspar is the dominant phase, the result is an antiperthite and where the feldspars are in roughly equal proportions the result is a mesoperthite. Sanidine is the high temperature form of potassium feldspar with a general formula K(AlSi3O8). Sanidine is found most typically in felsic volcanic rocks such as obsidian, rhyolite and trachyte. Sanidine crystallizes in the monoclinic crystal system. Orthoclase is a monoclinic polymorph stable at lower temperatures. At yet lower temperatures, microcline, a triclinic polymorph of potassium feldspar, is stable. Celsian is an uncommon feldspar mineral, barium aluminosilicate, BaAl2Si2O8. The mineral occurs in contact metamorphic rocks with significant barium content. Its crystal system is monoclinic, and it is white, yellow, or transparent in appearance. In pure form, it is transparent. Synthetic barium aluminosilicate is used as a ceramic in dental fillings and other applications. Litchfieldite is a rare igneous rock. It is a coarse-grained, foliated variety of nepheline syenite, sometimes called nepheline syenite gneiss or gneissic nepeheline syenite. Litchfieldite is composed of two varieties of feldspar, with nepheline, sodalite, cancrinite and calcite. The mafic minerals, when present, are magnetite and an iron-rich variety of biotite (lepidomelane). An endmember in mineralogy is a mineral that is at the extreme end of a mineral series in terms of purity. Minerals often can be described as solid solutions with varying compositions of some chemical elements, rather than as substances with an exact chemical formula. There may be two or more endmembers in a group or series of minerals. In subsolvus or two feldspar granites crystallisation occurs at high water pressures resulting in the formation of two types of feldspar as opposed to hypersolvus granites in which crystallization at relatively low water pressures results in the formation of a single feldspar variety. Quoting Tuttle and Bowen in 1958 : ″A classification of salic rocks based on the nature of the alkali feldspar is proposed. The classification has two major divisions: (1) subsolidus, and (2) hypersolvus, depending on the whereabouts of the soda feldspar. In the hypersolvus rocks all the soda feldspar is or was in solid solution in the potash feldspar whereas in the subsolvus rocks the plagioclase is present as discrete grains. The two major divisions are further subdivided according to the nature of the alkali feldspar modification.″ Note that here the word "subsolidus" unfortunately looks like a misprint and probably has to be replaced by "subsolvus". Rubicline, also referred to as Rb-microcline, is the rubidium analogue of microcline, an important tectosilicate mineral. Its chemical formula is (Rb, K)[AlSi3O8] with an ideal composition of RbAlSi3O8. Chemical analysis by electron microprobe indicated the average weight of the crystal is 56.66% SiO2, 16.95% Al2O3, and 23.77% Rb2O, along with trace amounts of caesium oxide (Cs2O) and iron(III) oxide (Fe2O3). This article incorporates public domain material from the United States Geological Survey document: "Feldspar and nepheline syenite" (PDF). ↑ "Feldspar". Gemology Online. Retrieved 8 November 2012. ↑ Anderson, Robert S.; Anderson, Suzanne P. (2010). Geomorphology: The Mechanics and Chemistry of Landscapes. Cambridge University Press. p. 187. ↑ "Weathering and Sedimentary Rocks." Geology. Archived 2007-07-21 at WebCite Retrieved on July 18, 2007. ↑ Harper, Douglas. "feldspar". Online Etymology Dictionary . Retrieved 2008-02-08. ↑ "spar". Oxford English Dictionary. Oxford Dictionaries. Retrieved 13 January 2018. 1 2 3 4 5 Feldspar. What is Feldspar? Industrial Minerals Association. Retrieved on July 18, 2007. 1 2 "The Mineral Orthoclase". Feldspar Amethyst Galleries, Inc. Retrieved on February 8, 2008. 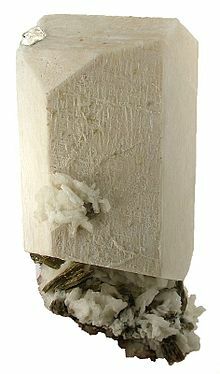 1 2 "Sanidine Feldspar". Feldspar Amethyst Galleries, Inc. Retrieved on February 8, 2008. ↑ "Microcline Feldspar". Feldspar Amethyst Galleries, Inc. Retrieved on February 8, 2008. ↑ Ralph, Jolyon and Chou, Ida. "Perthite". Perthite Profile on mindat.org. Retrieved on February 8, 2008. ↑ Celsian–orthoclase series on Mindat.org. ↑ Celsian–hyalophane series on Mindat.org. ↑ Nelson, Stephen A. (Fall 2008). "Weathering & Clay Minerals". Professor's lecture notes (EENS 211, Mineralogy). Tulane University. Retrieved 2008-11-13. ↑ Nasa's Curiosity rover finds 'unusual rock'. (12 October 2012) BBC News.